Together We Make a Family Blended Family Unity Sand Set. 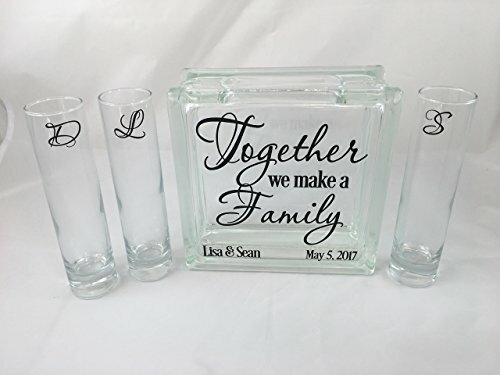 Set includes: 1 - 8" square center vase personalized with names of bride and groom and wedding date in your choice of colors. 6 - 8" tall by 1" diameter sand pouring vases Unity set holds 5-6 lbs. of sand depending upon brand and grain size. Note: Writing color should not match sand color(s) for best results. 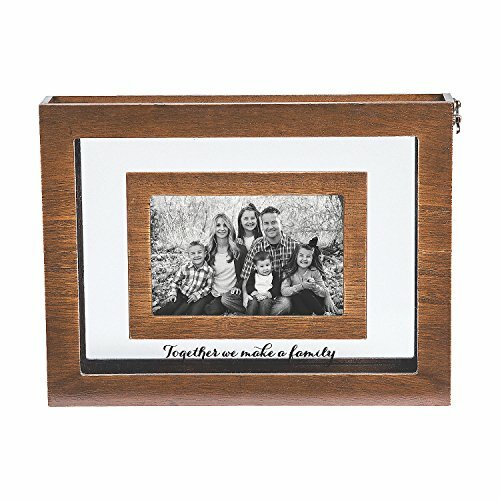 Make a statement about your family unity with this Blended Family Sand Ceremony Photo Frame. Include the children in the unity ceremony during the wedding; have each child and both parents add sand to the frame and put a favorite picture of the entire new family inside. This frame makes a great keepsake and home decoration after the wedding. Wood and glass. Measuring 12 Inch x 1 3/4 Inch x 9 Inch with a 6 Inch x 4 Inch photo space. Sand not included. Together We Make a Family Blended Family Unity Sand Set. 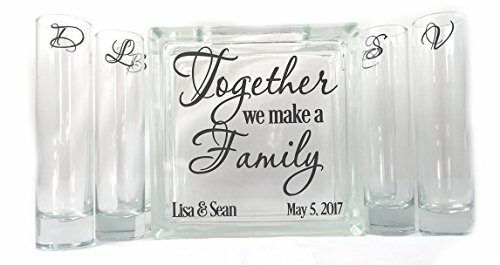 Set includes: 1 - 7.5" square center vase personalized with names of bride and groom and wedding date in your choice of colors. 4 - 8" tall by 1" diameter sand pouring vases Unity set holds 5-6 lbs. of sand depending upon brand and grain size. Note: Writing color should not match sand color(s) for best results. 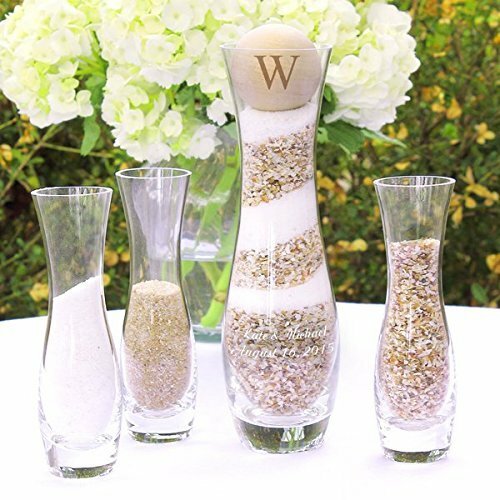 The Wedding Sand Ceremony is a memorable way to symbolize two families joining together, also makes a lovely vase! It is perfect for outdoor ceremonies and destination or beach weddings.This heart vase set will become a wedding keepsake that you will cherish forever! Together We Make a Family Blended Family Unity Sand Set. 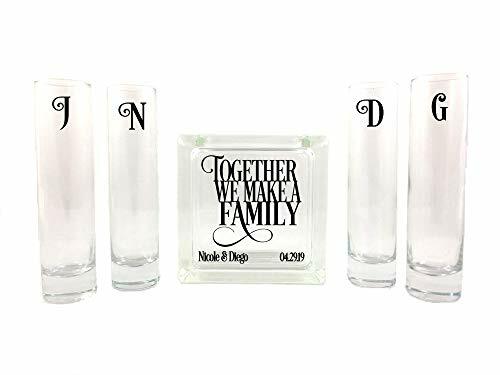 Set includes: 1 - 8" square center vase personalized with names of bride and groom and wedding date in your choice of colors. 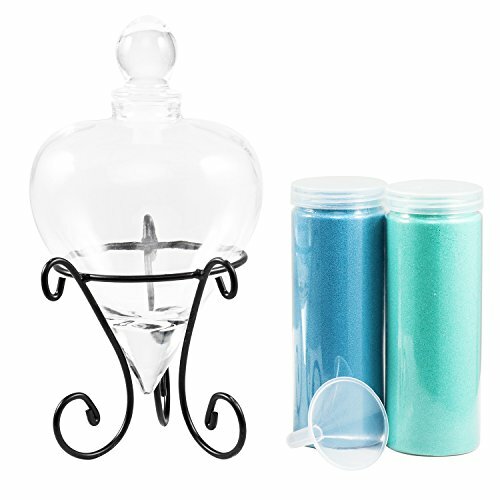 4 - 8" tall by 1" diameter sand pouring vases Unity set holds 5-6 lbs. of sand depending upon brand and grain size. Note: Writing color should not match sand color(s) for best results. 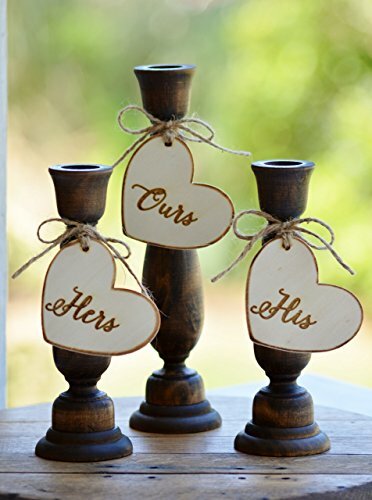 These rustic unity candle holders are solid wood and feature engraved HIS, HERS and OURS wooden hearts. The Ours candle holder is 9 inches tall. The his and hers candle holders are inches 6.75 inches tall. Personalized Rustic Unity Sand Ceremony 4pc Set. The Personalized Rustic Unity Sand Ceremony Set is a charming alternative to the traditional unity candle. Crafted into curvaceous silhouettes and topped with a stunning wood stopper, it will be the perfect addition to your ceremony. After the wedding, this unity sand piece will be a great keepsake for years to come. Sand not included. Together We Make a Family - Blended Family Sand Ceremony Unty Set. 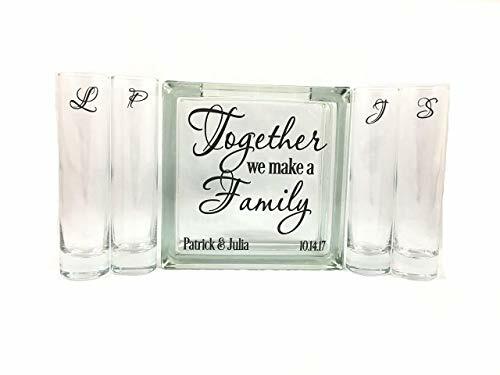 Set includes: 1 - 6" square center vase personalized with names of bride and groom and wedding date in your choice of colors. 4 - 8" tall by 1" diameter sand pouring vases (Additional pouring vases can be added on, please click on our name above for additional selections.) Unity set holds approximately 4 lbs. of sand depending upon brand and grain size. Note: Writing color should not match sand color(s) for best results. Your wedding day is supposed to be all about YOU but including your future stepkids in the ceremony is really worthwhile!